OpenNebula is an IaaS (Infraestructure as a Service) open source solution which allows to build private, public and hybrid clouds. It has been designed to be able to integrate with any kind of network or storage system and supports the main types of hypervisors: KVM, VMware vSphere (ESXi) and Xen. Next figure shows a typical schema of an OpenNebula infrastructure, which I am going to develop in future articles. The server named fronted01 runs OpenNebula and the cluster services. The principal components of OpenNebula are the daemon (manage the life cycle of virtual machines, network, storage and hypervisors), the scheduler (manage the deployment of virtual machines) and the drivers (manage the hypervisor interfaces - VMM -, monitoring - IM - and virtual machines transfers - TM -). OpenNebula needs too a database to save the information. We have two options: SQLite and MySQL. In my architecture, I will use MySQL and it will be installed on frontend01. 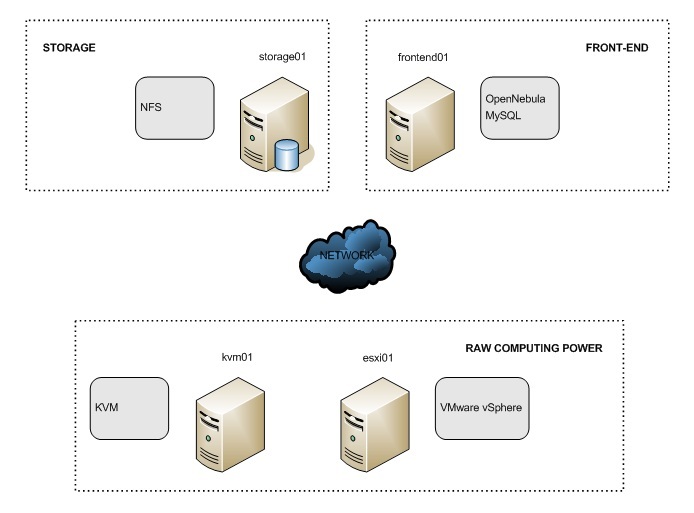 With respect to the storage, OpenNebula works with three possibilities: shared - NFS (there is a shared data area accessible by OpenNebula server and computational nodes), non-shared - SSH (there is no shared area - live migrations cannot be used) and LVM (there must be a block device available in all nodes). In the articles that I will write about it, I will configure a NFS shared into the storage01 server. It is normal as well to find some architecture where the storage is established inside the front-end. Also point out that the storage is used for keeping the virtual images and machines. As in any classical IaaS solution, we require the computing nodes (also known as worker nodes), which supply the raw computing power and where the virtual machines are run. In this example, I will employ two hypervisors: KVM (kvm01) and VMware vSphere (esxi01). OpenNebula must be able to start, control and monitor the virtual machines. The communication between OpenNebula and nodes will be carry out through the drivers previously configured. We can appreciate that OpenNebula is a fully scalable system, since we can add more computational nodes or storage servers based on our needs. Other features are portability and interoperability, due to we may utilize most of the existing hardware to set up the clusters. And finally, we face an open and standard architecture model, and besides, it can operate with other public clouds such as Amazon. An Informative Blog. Thank you. There's a really feel of change within the IT market which is difficult to disregard. With majority of corporations shifting in direction of subtle cloud options, the necessity for apt professionals is on the rise. A cloud computing course may be thought of a clever choice that may assist form up the profession and supply the stepping stone in direction of a profession full of latest alternatives.This is great blog. If you want to know more about this visit our Cloud Certified Site.